BIG BEAVER BORO VOL. FIRE CO.
BIG BEAVER FIRE CO. WILL BE HOLDING THEIR SECOND ANNUAL FIRERUN ON SATURDAY JULY 12, 2003. EVENTS INCLUDE A 5K RUN AND A 5K WALK. WE WILL ALSO HAVE REFRESHMENTS AND DOOR PRIZES. PLEASE CLICK HERE FOR MORE INFO AND A REGISTRATION FORM. Big Beaver Volunteer Fire Company, Station 14, Beaver County, Pa proudly protects approximately 2298 people living in an area of approximately 46 square kilometers. We operate out of 1 Station that protects primarily a residential area. Our department is a public department whose members are on a volunteer status. 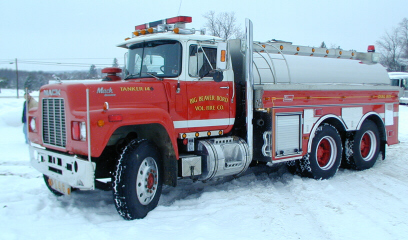 We operate 5 pieces of fire apparatus. ANYONE INTERESTED IN COMING TO ONE OF OUR MONTHLY DINNERS PLEASE CHECK OUT THE DINNERS PAGE FOR A COMPLETE LISTING OF THE MENU. PLEASE BEAR WITH US AS WE ARE RENOVATING OUR WEB SITE. YOUR PATIENCE IS APPRECIATED. THANK YOU. THIS SITE ALWAYS UNDER CONSTRUCTION! Learn what it is, where it comes from, and how you can PROTECT yourself. Smoke detectors could save you and your family's life. Please check our smoke detector page for very important information. Is your home safe? Check out the home safety checklist page !